This 3 Days Uganda safari tour takes you to Kampala Uganda’s capital city as well as the main commercial centre and Uganda’s closest National Park of all the 10 parks in the country; Lake Mburo National Park Uganda. Uganda’s capital Kampala is boarded by Lake Victoria; Africa’s largest fresh water lake and the source of the world’s longest river; River Nile. The 3 Days Kampala city tour and Lake Mburo National Park short wildlife safari tour will guarantee you chance to see thousands of Burchell’s Zebras, hippos and crocodiles. For the birding enthusiasts, this park is close to paradise. Lake Mburo National Park Uganda is the only place in Uganda that supports massive herds of “impalas”. This where Uganda’s capital city derives its name “Kampala”. Other animals to encounter during the one short Uganda wildlife safari to Lake Mburo National Park include; antelopes easily seen are topi, bushbuck, common duiker, oribi, Defassa waterbuck and Bofor reedbuck. Buffalos, warthogs, bush-pigs and hippopotamus and many others. Day 1: Do your Kampala city tour -visit the Royal palace in Mengo, Kasubi tombs, Namirembe cathedral, Rubaga cathedral, Bahai temple, Uganda Museum and Uganda martyrs Namugongo. Day 2: Transfer from Kampala to Lake Mburo National Park for your afternoon boat cruise with a break in the journey at the Equator in Kayabwe. You can also opt to do a night game drive in the park. Day 3: Do an early morning game drive in the park, and later do horse riding or quad biking and then return to Kampala. After your early morning breakfast at around 8am, you will meet your safari guide at your hotel. He will give you a very short briefing about your 3 Days Kampala city tour and Lake Mburo National Park short wildlife safari tour and after depart Kampala city tour where you will visit the Buganda cultural sites like the royal palace in Mengo. This is the main palace and official residence for the Kingdom of Buganda, of the four generations of reigning Monarchies and the members of the Royal Family since 1885, full of exciting scenes and art galleries. The Mengo Palace is situated on Mengo hill opposite the headquarters of the Kingdom Administration at Bulange. You will then drive to Kasubi Tombs; an active religious place in the Buganda Kingdom as well as a burial ground for the Kings of Buganda. After Kasubi tombs, you will visit Rubaga cathedral; the oldest Roman Catholic diocese in Uganda and also the home church of Archbishop of Kampala. Drive to Namirembe cathedral on Namirembe hill, the oldest cathedral for the Anglican church in the country also taken to be the headquarters for the Anglican people in the country. After a visit to these places, you have lunch in one of the restaurants in town. After Lunch, you will visit the Uganda Museum that displays and exhibits ethnological, natural, historical and traditional life collections of Uganda’s cultural heritage over the years. You will then proceed to the Uganda Martyrs shrine Namugongo is Roman Catholic minor basilica dedicated to the Ugandan Martyrs who were murdered in cold blood for their Christian faith and finally go at the Bahai temple, the only temple of its kind in Africa as well as for the Bahai faith in Africa. In the evening after your Kampala city tour, you will transfer back to your hotel for your dinner and overnight. You will be required to take early morning breakfast before you depart from you hotel/lodge at 7am to start your journey to Lake Mburo National Park for your one-day short wildlife safari Uganda. the journey will take you about 4 hours without the stop overs driving for about 235km from Kampala. 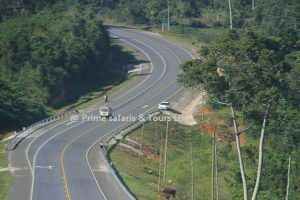 You will drive through several small towns and villages enjoying the beautiful greenery seen on the lush rolling hills making Uganda an ever-green country hence the name the “Pearl of Africa”. Upon arrival at the equator in Kayabwe, you will take lots of Photographs standing in two hemispheres at the same time, visit the souvenir shops around and have an exciting polar water experiment. Retreat from the equator and proceed for your lunch in Mbarara town. After your lunch, drive for about 1hour to Lake Mburo National Park for your afternoon boat cruise. The boat cruise take about 2hours sightseeing hippos, crocodiles and lots of birds. Return from your boat cruise and check in your accommodation for dinner and overnight. You will have an early morning game drive in the park giving you chance to have wonderful views of several wildlife that habit the park including; Impalas, Burchell’s zebras, antelopes, topi, Bushbuck, common duiker, Buffalos, to mention but a few. You will go back to the lodge after your game drive for your breakfast and prepare for your horse riding or quad biking and then return to Kampala.